Why should you let this guy into the house? • Over 12 years experience carpet cleaning in Kelowna. Marv personally guarantees your clean carpet / upholstery satisfaction! * The Steam Age is over. Modern Molecular Technology Discoveries allow us to produce beautiful clean carpets without using toxic chemicals or large quantities of water. 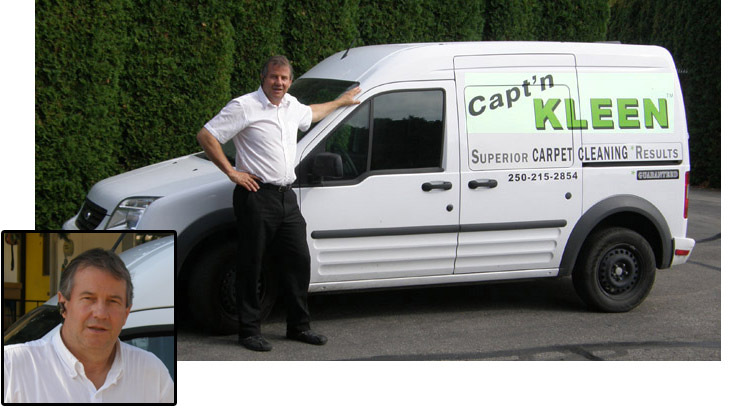 Capt'n Kleen Carpet Cleaning Process reduces waste water. Our multi-Step Process enables us to produce excellent carpet cleaning results with less water - quicker drying time and good for the planet! Carpets will be odour neutral. We love pets! Capt'n Kleen is reasonably priced. Carpet cleaning service in Kelowna, BC.